Watching Gary Oldman as Churchill in 'Darkest Hour' at the Tyneside Cinema, I felt quite emotional. I was angry - if it was left to the Tories in 1940 they would have surrendered to Hitler. The continuing battle over Ken Livingstone's Labour Party membership has shown how the issue of anti-Semitism has become an important part of the party's internal struggle. This month marks the 80th anniversary of what has gone down in history as the Battle of Cable Street. On 4 October 1936 thousands of workers across the East End of London rose up to prevent a march through their areas by the uniformed thugs of Oswald Mosley's fascists. Workers across France are stepping up their action against the country's new labour law, with strikes in various sectors and big demonstrations. The French working class has a long history of struggle, including widespread sit-in strikes in May-June 1936. To celebrate the 80th anniversary of this movement, and to learn its lessons, here we carry an extract from an article written by Socialist Party general secretary Peter Taaffe and published in Militant (predecessor of the Socialist) in 1978. Livingstone suspension: 'Slow coup' against Corbyn. 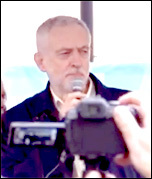 The furore around charges of anti-Semitism engulfing the Labour Party is, in reality, an orchestrated and cynical new stage of the campaign by the right-wing pro-capitalist wing of the Labour Party to try and prepare the ground for ditching Jeremy Corbyn at the earliest possible opportunity. One hundred years ago World War One began, unleashing slaughter on an unprecedented scale. 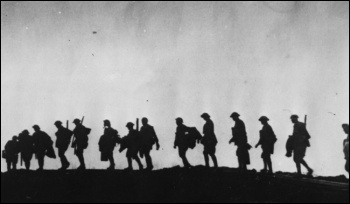 It was dubbed the 'Great War', the 'war to end wars'. For the ten million killed and more than ten million seriously injured it was certainly not great. Seventy years ago, the major powers plunged humanity into the horror of world war, Peter Taaffe writes in the latest Socialism Today, magazine of the Socialist Party. THE BRITISH National Party (BNP) diligently cultivates its new image of smart suits and 'legal' respectability, writes Keith Whitehead. The Holocaust - who was to blame? The sixtieth anniversary of the liberation of Auschwitz has produced a plethora of TV and radio documentaries, newspaper features and statements from leading politicians. All of these rightly express revulsion and condemnation of the most evil and barbaric regime in history.